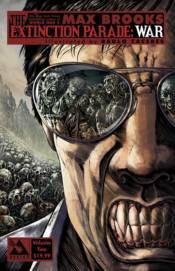 New York Times bestselling Author, Max Brooks returns to the frightening world of zombies versus vampires in his groundbreaking follow up series: Extinction Parade: War! Well known for his breathtakingly original fiction, Brooks pushes the limits of the horror genre with his trademark meticulous research and vision for the next evolution in zombie storytelling. The subdead were always a joke to the aristocratic vampire race. Just a spec on the radar of their immortal lives, nothing worth even a moment's notice in their quest for self-gratification through the veins of their host, the human race. But at last they have been pulled from their ignorance into the reality of the new world order. The human race is facing extinction and should they succumb, so too shall the vampires disappear beneath the waves of rotting walking dead. Now the vampire race has mobilized and formed a grand Army of the Bloodline to combat the growing threat of extinction. But after centuries of ambivalence will they be able to learn how to wage war before it is too late? This volume collects the Extinction Parade: War #1 - 5 comic book series.